Yes, this is a blog post about packing lunches. (Well sort of…I am going somewhere with this…I promise). This may seem like a weird thing to write about, unless you are a parent with a kid in school, in which case – like me – my guess is that you also have very strong feelings about packing lunches. Some of you actually seem to like this most-annoying-of-my-morning-tasks. Yeah, I see you with your pictures on Facebook showing me how beautiful your lunches are. Let me say quite sincerely – good for you. You have found some semblance of enjoyment in something completely infuriating to me and for that I applaud you. (Pause to politely applaud parents who enjoy making lunches and take nice pictures of them. Also to those of you who write nice notes to your kids in lunches. Also to those of you who make those really fancy snacks in shapes of kid-friendly characters when you are asked to bring treats into school. Etc.). By now you can probably guess that my strong feelings towards lunch making are not because I like it. No, I do not like making lunches at all. Making lunches for my kids is like spinning a roulette wheel called “What Will My Kids Actually Eat Today?” – only on the roulette wheel, at least half of the spaces say NOTHING AT ALL. I thought I could pack them that sandwich exactly like the one I made yesterday? I thought I could pack that fruit that they told me they LOVED when they saw it in the grocery store? I thought if I bought a thermos that they would eat pasta, which is their favourite food at home? Please note here that I am, of course, very thankful to have the resources I need to feed my kids. I’m not saying that this is the biggest problem in the world – far from it. All I’m saying is that lunch packing roulette is just a bad start to the day. Which is why today I did a happy dance – and I know all you packing-lunch haters danced with me. 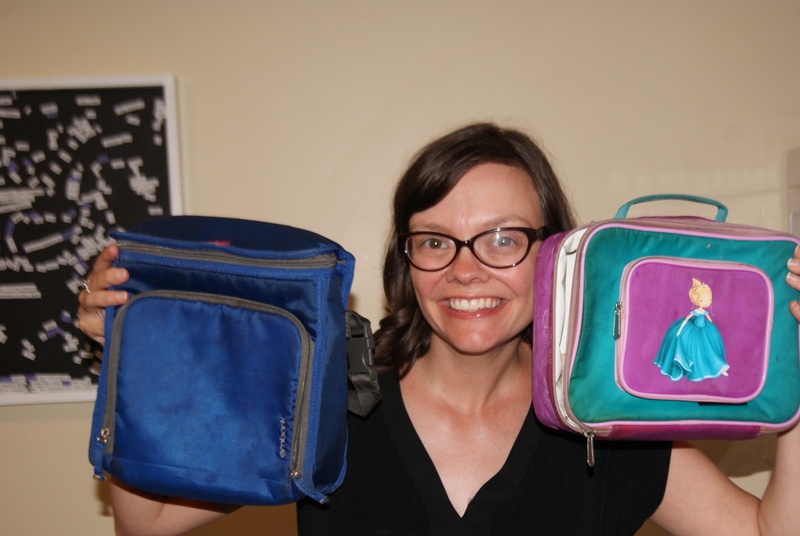 Today was the last day of school and with JOY I packed their last two lunches!! I almost took a picture. I smiled to myself as I remembered: I never actually get to STOP making them lunch. Yes, in our case, it is a little easier to come up with options at home – but there is really no such thing as a “last lunch” on this parenting journey. They’re going to wake up tomorrow and dangit if at about lunch hour they won’t be hungry again. So what I want to say here is not really so much about packing lunches. It’s about saying “Way to go” to all the Moms and Dads and caregivers out there of any kind. Because the job does just keep going. Because there will always be jobs that you don’t like doing that you will do anyway. Because we all need to celebrate each other a little more – and if you need to celebrate by posting a picture of a great lunch you made, have at it. And if you need to celebrate because you survived a year of lunch making roulette and you’re getting a break from it for a couple months, that’s great too. We have a group of moms of young kids that meet at our church every two weeks. The kids play a bit and then (thanks to some awesome people who provide childcare) the moms get a little adult time. Each time when we gather I start by saying “What was your Mommy WIN this week?” In other words, what did you do well? What can we celebrate with you? The moms usually find this hard. They have lots of ways they feel they lost: The kids are out of control. Their baby is still not sleeping. Their house is a mess. They lost their patience. They gave their kids lunch-ables four days in a row. Before some of you get all freaked out at me, I’m not saying that we set the bar low here. Obviously as parents we need to do more than feed our kids and get them out the door. Sometimes we need to celebrate because that’s exactly what we did. So today, I’m throwing myself a little party in my head – no more packing lunches!! I survived a whole year of it and most days I didn’t do too bad. Wahoo! I know I’ll still have to feed them tomorrow, but for today I remind myself: WIN!!! (And we all say together…) WIN! I love the photo, way to go Leanne!